Begin the morning with an uplifting and inspiring show! 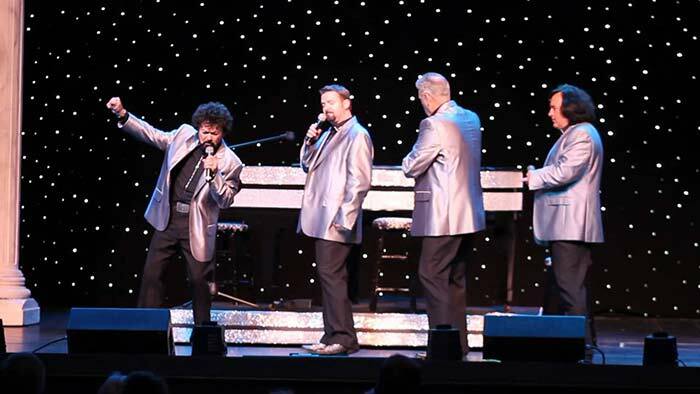 The Blackwood Brothers Pigeon Forge show will fill your heart with gladness as they sing some of your favorite gospel songs, Broadway tunes, and oldies. Enjoy what many visitors hail as the best of all the religious shows in Pigeon Forge, TN! R.W. Blackwood Jr.'s father sang baritone in the original Blackwood Brothers gospel quartet. Founded in the Great Depression by Roy Blackwood, a preacher from Mississippi, the quartet gained fame in Memphis, TN in the 40's and continue to have a large following. The group's biggest hit "Learning to Lean" holds the record for topping the gospel music charts for longer than any gospel song in history. The Blackwood Brothers have recorded over 200 albums, sold 50 million records, and won 8 Grammies, making them one of the most successful gospel groups of all time. The Blackwood Brothers Pigeon Forge Show has been a long-established tradition of Smoky Mountain vacationers. The longest running of all the religious shows in Pigeon Forge, TN, the Blackwood Singers provide quality, family-friendly entertainment that everyone will enjoy. The talented Blackwood Singers in Pigeon Forge present a show that inspires everyone with laughter and song. The comedy in this show is suitable for the entire family, and you'll have you toes tapping to the uplifting music and song these talented singers perform. Come see why so many people start their mornings with this fantastic show! Throughout the show, these singers will perform some of your favorites. From "How Great Thou Art" to "Oh, How I Love Jesus," "Old Country Church" to "Old Rugged Cross," these songs will lift your spirits and send them soaring. Tap your feet as the piano plays upbeat accompaniment to the beautiful harmonies of the Blackwood Singers. In between songs, these inspired singers will share their personal testimonies and stories of inspiration. Enjoy a portion of the show that is devoted paying tribute to America. Filled with patriotism, faith, and joy, the songs in the Blackwood Brothers Pigeon Forge Show offer entertainment that will stay with you long after the show. In addition to uplifting songs sung by the Blackwood Singers, Blackwood Brothers Pigeon Forge Show also offers comedic relief from two extremely talented ventriloquists, Bob and Marty. Laugh at the dry humor provided by these comedians who will astound you with their talent as ventriloquists as well. From inspirational songs to comedic relief, this show will brighten up your morning (even for that person who isn't quite the morning person)! Stay close to Blackwood Brothers Pigeon Forge Show and other Religious Shows in Pigeon Forge! Cabins USA's vacation rentals in Pigeon Forge place vacationers to the Smoky Mountains close to all the action of the Pigeon Forge Parkway. Gain quick access to all the live entertainment, dinner shows, and shopping that Pigeon Forge offers. Enjoy the comforts of home and a convenient location at a Cabins USA vacation rental!